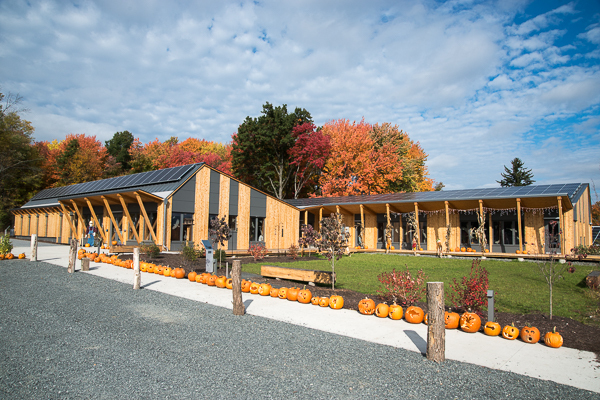 The Hitchcock Center for the Environment (HCE) is a nonprofit environmental education center in Amherst, MA that has served Western Massachusetts for over 50 years. The Center serves over 9,000 visitors annually through educational programing and events that are open to the public. 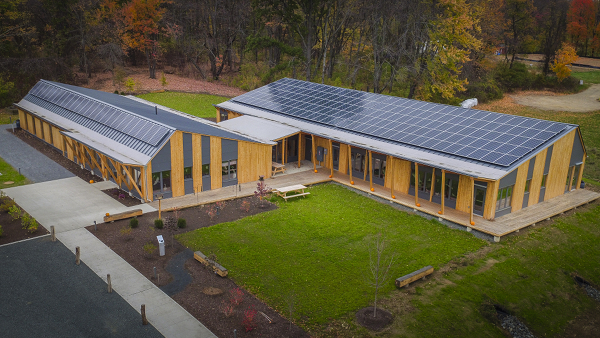 (www.hitchcockcenter.org) In 2016, HCE completed a new 8,900 square foot net zero energy and water environmental center. In planning for its new facility, HCE needed additional educational space for programing and a building that amplified its environmental education mission as a leader in sustainable design and operation. 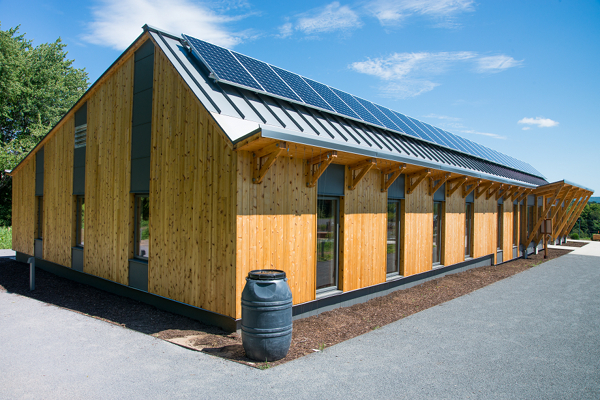 HCE built to the highest standard of sustainable development in the built environment by taking the Living Building Challenge (LBC). This required HCE to meet over 20 rigorous performance standards that include zero net energy and water and the use of locally sourced, non-toxic materials. The Hitchcock Center is excited to begin the 12-month audit period toward achieving LBC, estimated to begin in early 2017. Conventional poured in place concrete foundation wall wrapped with 4 inches of expanded polystyrene insulation. Hollow metal door with polyurethane core. Ceco Door, Assa Abloy 1-3/4" Trio-E Door. 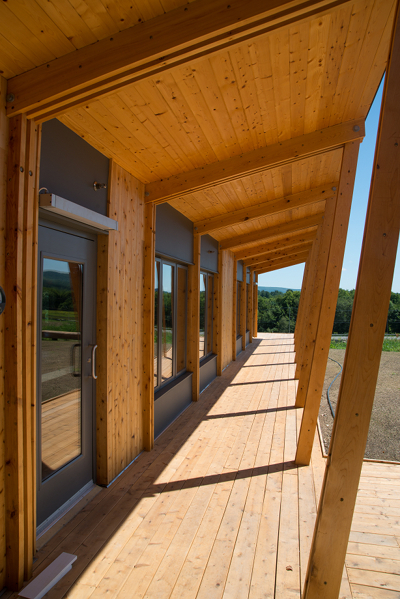 The project was to build a 8,500 square foot environmental education center, to meet the Living Building Challenge. The site is located on land owned by Hampshire College. It was a former apple orchard and as a result was contaminated from lead arsenate spraying. The Hitchcock Center developed a plan to remediate soils on the site by stripping the top 7-9 inches off the surface. Contaminated soil was buried under the parking area, reducing costs for trucking and disposal off site. New clean soils from local sources were brought in to the site for landscaping and grading work. Renewable Energy System Description & Details: The Hitchcock Center's building uses a 60kw photovoltaic array comprised of Sunpower SPR-E20-327-COM modules. Each panel has an area of 1.63 square meters so each panel will produce 1.13kWhr per day per panel on your system. Annually the solar system can produce an average of 76,134 kilowatt hours per year (provided no shade grows that will effect production). SolarEdge inverters are used to convert DC to AC current. Note that the power rating is 60,495 Watts DC, 54,000 Watts AC. Source of Annual Production Data Estimated and modelled based on ASHRAE 90.1 and 140. The envelope design is based on continuity of the insulation layer and air barrier from footing to eave to ridge to eave to footing. Great effort was made to eliminate thermal bridging. For instance, all roof overhangs (used to harvest rainwater) are independently framed outboard of the insulation layer and air barrier. The actual R-value is not remarkable - R39 - but the designers believe continuity makes up for that. For instance, our recent blower door test shows an extremely tight building meeting Passive House standards. Slab edge is isolated from grade our out door air by 4 inches of expanded polystyrene insulation. We used an integrated process that is highly collaborative. Over 8 different disciplines were represented in our design team, from mechanical engineers and landscape designers to our construction manager and exhibit designers. 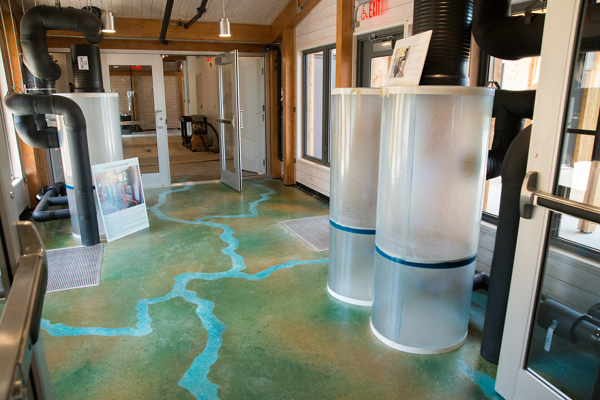 As well, our environmental educators and staff of the Hitchcock Center had a central role at the design table. The whole project team was tasked with the entire building and all of its systems together, emphasizing connections and improving communication among professionals and stakeholders throughout the life of a project. Disciplinary boundaries were broken down and linear planning was reduced to promote great efficiency and effectiveness in the design process. Our integrated-design approach required more time on the the front-end – from concept design to construction documents - nearly two years but the outcome is a beautifully executed and on-budget building. Open column free spaces and slab throughout. The project goal was to design and build a building to meet full Living Building Challenge certification. Following construction and occupancy, the building enters a 12-month audit period. This period has not yet begun. Not enough data is available to date. Occupants have been in the building for only 2 months.